The exotic gold and charcoal brush is particularly useful for those looking to whiten their teeth. This brush merges the antibacterial properties of gold with the natural whitening properties of bamboo charcoal. nano-b recommends this brush for anyone with stained, discoloured teeth. The magic s in the bristles. Each bristle is coated with natural gold and bamboo charcoal dust invisible to the naked eye. The dust is comprised of microscopic particles that release negatively charged ions, which kill bacteria by suppressing cell respiration and metabolism. This is bad news for bacteria, but good news for you. By terminating any bacteria on your brush, you avoid brushing with common bathroom nasties like e.coli and salmonella. You re also protected from airborne bacteria, keeping you safe from the common cold to nasty illnesses such as bowel cancer. It s not just about being antibacterial. nano-b is also committed to providing a brush that offers superior cleaning capabilities. All nano-b brushes come with a double-layered bristle structure. The long, thin bristles clean deeply in hard to reach areas of the mouth, gently pushing the gums upwards to remove bacteria where it gets trapped, preventing common plaque buildup. The short, oval bristles gently polish the surface of the teeth, leaving you with a sparkling smile. One of nano-b's core goals was to create a brush that looked different. nano-b wasn t impressed by the design quality of other toothbrushes on the market, and wanted to create something that looked genuinely attractive and modern. nano-b disliked garish colours, funky shapes and ugly patterns. nano-b brushes are clean, smooth and transparent. Brushes come in a range of crystal colours, have smooth handles and a beautifully nimble head. Finally, a brush that looks at home in your bathroom. The nano-b brush is a merger of nature s expertise and oral science. 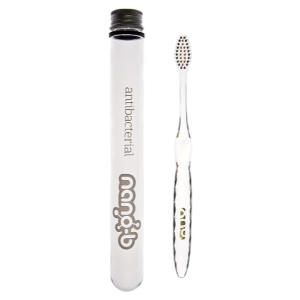 nano-b brushes are uniquely antibacterial in that they kill bacteria through natural means. Gold has natural antibacterial properties, and has been used as a disinfectant centuries. Gold releases ions that penetrate into bacterial cells, terminating the organism. nano-b has modified the gold element into nano-sized particles so that they can work safely and effectively on your toothbrush. nano-b calls it natural science.